Bakery. 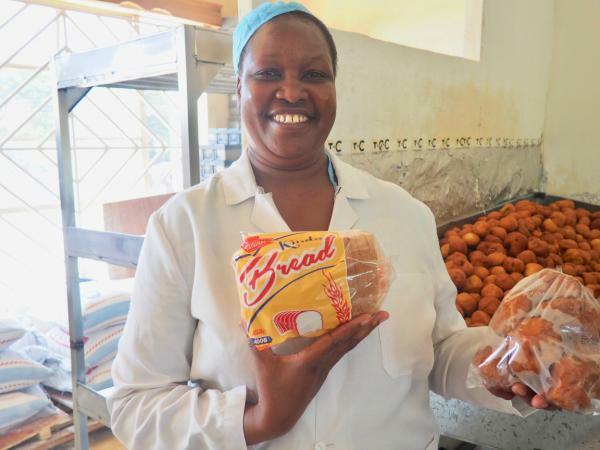 Using solar-dried sweet potato flour supplied by neighboring farmers, Caroline began making chapatti and eventually, fresh bread. foods. PFS is a non-profit organization formed by General Mills to link the technical and business expertise of volunteer employees from leading food companies - including Cargill, DSM, Bühler, Hershey and Ardent Mills - with food entrepreneurs in Africa. are bright and it’s clean, it has made us go a notch higher,” said Caroline. out, so the SAFE team established a marketing plan that would enable them to reach new consumers. First, project staff conducted a market survey in Kendu Bay, identifying market needs, challenges, and opportunities for expansion. texture, and sweetness. Armed with reviews from the local market, Rose was then able to perfect the recipe. Never ones to rest with more work to be done, Rose and Caroline are currently working on a new chocolate sweet potato biscuit formula as well. snacks for years to come.